Despite her protestations, a sixteen-year-old girl is forced to attend a support group. Hazel suffers from stage IV thyroid cancer and her parents have determined she is depressed. That emotion would most certainly be a reasonable one, but melancholy would probably be a more apt description of her state of mind. One day seventeen-year-old Augustus Waters walks into the group. He used to play basketball before he was fitted for a prosthetic leg. Though he is a bone cancer survivor, he is merely there to encourage his friend Isaac (Nat Wolff). In support group Gus worries about “oblivion” – that is not being remembered – after he has passed on. Hazel is an acerbic pragmatist. She feels his fear is unimportant and tells him to get over it. Their little exchange is cute and it lights the spark for a friendship. Possibly more. While some advancements in the narrative can be predicted, others are rather unexpected. For example, they each recommend their favorite book to one another. Her chosen novel leads to an encounter with its reclusive author (Willem Dafoe). It is just one of several fascinating developments. On the surface, one might view The Fault in Our Stars as just another chronicle of star-crossed lovers. The thought-provoking title was inspired from a line in Shakespeare’s Julius Caesar. Cassius says to Brutus: “The fault, dear Brutus, is not in our stars, / But in ourselves, that we are underlings.” Here the title has apparently the exact opposite meaning, that our stars, or destiny, can be cruel through no fault of our own. While the drama concerns the ups and downs of suffering from an illness, it actually has a much more philosophical appeal as a tale that captures the awkwardness of adolescence. 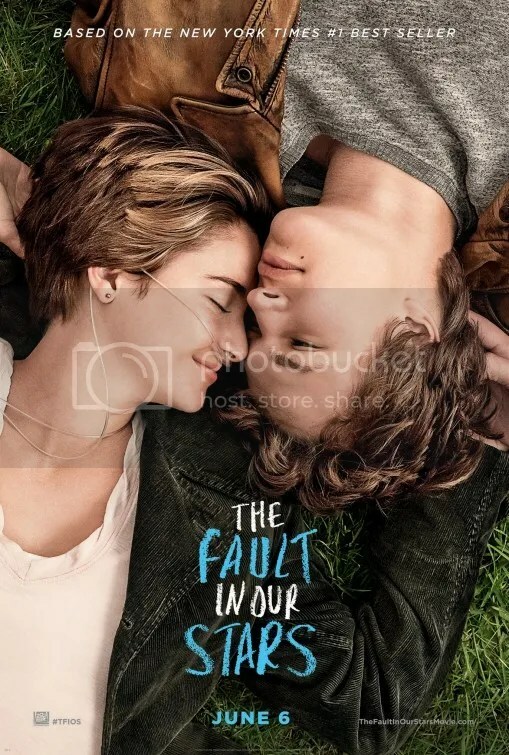 John Green’s 2012 teen lit best seller The Fault in Our Stars is faithfully adapted by Scott Eric Neustadter and Michael H. Weber. They are the talented writing team behind young adult successes (500) Days of Summer and The Spectacular Now. Fault is another shining example of the genre. The saga is ambitious for the depth of feeling explored within their relationship. The screenwriters have a nice facility for extracting genuine emotion that doesn’t ever seem forced or overwrought. Gus and Hazel‘s exchanges are funny, intelligent, and insightful. But what truly separates an account that tackles a subject as inherently manipulative as cancer, is the sincerity of the performances. Shailene Woodley (Hazel) and Ansel Elgort (Gus) are an extraordinary team. At times Augustus seems too good to be true. “Why are you looking at me like that?” Hazel asks. Augustus half smiles “Because you’re beautiful. I enjoy looking at beautiful people.” Cue the biggest contented “Aw!” from my mostly female audience. To be fair, that corny dialogue is taken directly from the book. Gus pontificates in soliloquies. His undeniable charisma sometimes drifts into ersatz charm. Occasionally the cuteness quotient beaks the scale and the preciousness seems like it might derail the production. It never does though. The two remain an engaging pair. Their effortless rapport details passion, doubt, and insecurity. The way their relationship unfolds is particularly affecting. The couple exudes a substantial amount of chemistry together that is, pardon the pun, “faultless”. It is organic and natural. Their considerable heart is a rarity these days. That is what separates this from other romantic dramas of the past. Equally touching as the bond between Jenny and Oliver from Love Story. Perhaps even more so. I always felt Jenny was a bit caustic for my tastes anyway. Hazel and Gus are a memorable twosome. The Fault in Our Stars is a love story for the ages. This entry was posted on June 8, 2014 at 2:13 pm and is filed under Drama, Romance with tags 2014. You can follow any responses to this entry through the RSS 2.0 feed. You can leave a response, or trackback from your own site. I’ve read the book and I was so amazed with Green’s writing that I’ve just finished every single book of him. He is a talented writer and probably “The Fault in Our Stars” is his most special book. It’s a lovely tale of survival, love and friendship that made me cry, laugh and live an unforgettable adventure. I’m really looking forward to watch this one. Great review! John Green’s first novel Looking for Alaska is his most celebrated novel after The Fault in Our Stars. They were going to make a film of it back in 2005 but Paramount Studios ultimately lost interest for some reason. I’m following your blog now. I look forward to your review. In not realizing this was written by the guys behind The Spectacular Now and 500 Days, I’ve made a slight error in not seeing this sooner! But considering it a must-see now, I loved both those movies as the relationships that blossomed felt genuine despite cliched trends and predictable fates. I already *think* I know how this will end, but I think I’m going to enjoy the ride anyway. Yeah it’s more about the journey not the destination. It’s a special film. I liked the movie, too. But we have one big difference: I was not //that// convinced by Elgort’s performance. I think he got the looks down and the scenes that require him to be adorable (“We’re just friends.” / “I’m not.”; Also, the “I like looking at beautiful people” line you mentioned above), but he is not equipped to handle dramatic scenes that require subtle gravity–a skill that Woodley, in my eyes, has pretty much got down pat. Despite this, I still enjoyed the movie because it has enough moments of truth that is specific to its protagonist. It’s not just some disease-of-the-week picture. P.S. : Wasn’t Laura Dern good in this? I wanted to give her a hug! What a coincidence! I JUST added “Mask” on my Netflix queue literally about an hour ago. Franz, “Mask” is a classic. I remember it playing on cable constantly when I was a kid. I haven’t seen it in a while; i should give a rewatch sometime. I’ve actually never sat and watched it all the way at once. I’ve seen the whole thing, but only in pieces at a time. I’ll definitely check it out. Moved it to the top spot on my Netflix queue but, darn it, it’s under “Very Long Wait.” I hope to get lucky when someone returns the DVD. Great review, Mark. I didn’t expect to like this film very much, but I did, especially Shailene Woodley, who is just superb in this film and looks very pretty. Yeah Shailene Woodley has been turning in one wonderful performance after another. Very impressed with the young actress. Me too. Plus, she’s so beautiful. Didn’t work for me because it seemed so full of itself, and then gets incredibly schmaltzy at the end, without ever bearing a moment of truth. Good review Mark. Well the ending was incredibly sad but I found it rather poignant. Great review. I really cannot wait to go and see this. I am a fan of Green’s work, he is really good, and this book was a thing of beauty. I really hope the film can live up to it! I’ve heard the script cribs liberally from the novel. Much of the dialogue is verbatim so fans of the book should be pleased. That is something I saw from the trailers, so I am hoping it sticks like that across the whole thing! I read the book… and didn’t love it. It was okay. Found both main characters annoying. Didn’t cry. Was almost ostracised from book club. Going to see if the film helps to bring it to life. Hmmmm. You might be disappointed. The performances are great but Hazel and Gus have the exact same personalities as in the book. Nice review, Mark! I’m really looking forward to this! June 19 in your area. Enjoy! So, what made you decide on a 4 star rating? How come not a 4 and a half? Not debating, but just was wondering about your assessment. I give it 9/10. The reason I took a point off was b/c I felt like they were stereotyping Christians and making fun of Christians with that Peter (i think that’s his name) character that was leading the support group. Realistically, having faith would be very beneficial to coping with an illness, and even in some cases could inspire healing. I just thought it was in bad taste to make the Christian look like a complete clown, when a strong-willed Christian and faith-filled mindset could be a very positive thing. But this wrinkle wasn’t enough to take away from the movie as a whole; if the Christian had been portrayed differently and from a place of strength, I think I’d give this one a 10 b/c everything else was pretty much flawless. Loved the development of the two main characters and their stories; so good to see a love story where the couple are actually friends for a good while before becoming an item. It makes the relationship much stronger. As you could tell once finally coming together, they never would have broken up b/c they laid such a strong foundation. We need more stories like this. I suppose it’s standard to read the book and then see the movie. I almost always prefer to do the opposite. I am weird that way. The rating is my emotional reaction to a film. I can think of many romantic movies I enjoy quite a bit more: Roman Holiday, It Happened One Night. This is most definitely a full star behind those classics. I agree with you, so I don’t think it’s weird to watch the movie first and later read the book. If I had read Fault in our Stars before watching the movie, then I would have known what was going to happen and would not have been surprised. The element of surprise and how your emotions react is what makes movies worth watching. This is why I always say I don’t like watching movies that follow the same formula b/c they don’t make me feel anything. I love films that shock me like The Hidden Face and Orphan; it’s like a magician’s trick of misdirection. You’re looking at something and then later on realize that very thing you’ve been looking at for so long is something different. “Fault in our Stars” actually pulls off misdirection, as well, as you keep watching and dreading that one thing to happen (i’m avoiding spoilers), but actually it happens differently than you were expecting. So, that’s probably another reason I liked it so much b/c not only were the two characters interesting to watch, but it also tricked my brain, and that’s what makes films interesting. When a movie has me crying after I’ve left the theater, then I know it captured me emotionally. That doesn’t happen very often. I think when I saw “The lives of others,” was the last time. That was 2006 or 07. It was definitely the acting that did it. I already knew the story was going to be sad, but it was the performances that got me going. Shailene, Angus, Laura and his friend were brilliant. I will remember this movie for a long time. Just loved it! 4 1/2 stars. I’m not going to list everything since 2007 but Extremely Loud & Incredibly Close had you in tears. That was January 2012. Great review, Mark. Definitely a good movie and a strong adaptation of am excellent book. And the actors? Yeah, they’re pretty awesome. The Best Supporting Actress campaign for Laura Dern begins now. It certainly has. I hope to see enough movies to keep coming back. I completely agree that Neustadter and Weber have an innate ability to mine emotion in a way that never feels forced in their story and dialogue. That’s one of my favorite aspects of their films. Their sensibilities play so nicely with the effortless chemistry between Woodley and Elgort. I think my main complaints with this one were that Gus could come off smug and obnoxious at points and that there were a few scenes that were trying to emotionally manipulative in a bad way. Overall though, I was surprised how much I fell for this flick. I think Scott Neustadter and Michael H. Weber are adapting John Green’s young adult novel Paper Towns next. Looking forward to that. The scene in the Anne Frank house was the height of offensive, and the Gus character was too annoying! Ugh! I couldn’t wait for him to die.